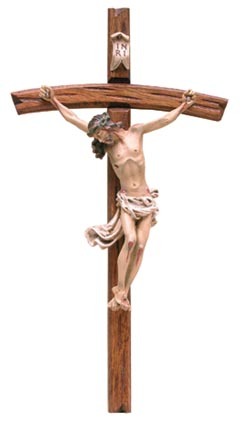 A beautiful wooden crucifix with an image of our Lord Jesus in resin, lovingly crafted in a third generation Catholic family business. * Please note: as crucifixes ship from Peru delivery may take up to 4 weeks. Since 1927, Santa Teresita Religious Art, has dedicated itself to the creation of religious figures and images. This was made possible by the vision of the sculptors and couple, Giovanni and Maria Estere Pierinelli. They were able to combine their artistic knowledge and fine Italian tradition, with the extraordinary manual abilities of Peruvian Artisans (South America), thus establishing themselves in this great country. Our third generation family business keeps our grandfather's legacy alive by producing handmade works. The materials we use include among others plaster, resin, wood, fiberglass and metal. With God's blessings and proudly committed to Him through our daily work, we keep growing and developing in order to keep offering the best service to our customers and friends.